Hey BPT Blog Readers! Today I want to feature a guest article that one of our readers submitted about exotic/getaway weddings. Emily Jacobson (our guest author) offers great advice if you’re thinking about an alternative to the traditional wedding. Thanks Emily! 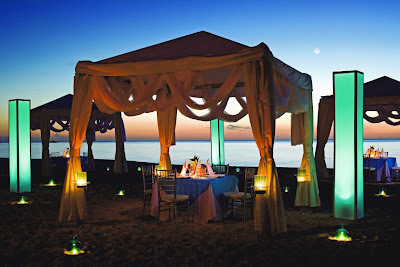 Romantic getaway weddings are coming of age! All you need is the Internet (or a phone) to arrange any kind of celebration in any imaginable locale, including everything from dancing elephants and fireworks to trousseau, rings, and license. If what you want isn’t already offered, wedding planners will work with you to create the wedding of your dreams. Many couples are attracted to the idea of a worry-free wedding. Why not, when planning a fantasy summer destination wedding is as easy as ordering pizza? At Exotic Indian Weddings, for example, you can choose a romantic beach wedding, a jungle wedding, a river-rafting wedding, or a Himalayas wedding in a package to suit your budget. For something more stately, you might choose an India palace wedding on a small island. The Wedding Experience displays a map of the world and gives you the option to choose from locales as diverse as Amsterdam, Tahiti, and San Francisco. They also offer cruise ship weddings and will see to all your travel arrangements. If your family is dismayed by the prospect of being left out, wedding planners will provide for their travel arrangements and accommodations as well. Formerly known as eloping, the exotic destination wedding has many advantages over conventional weddings, not the least of which is cost. In “Beyond Vegas: 25 Exotic Wedding and Elopement Destinations Around the World” by Lisa Tabb and Sam Silverstein, the couple provides a compendium of exotic destinations like Borneo where complete wedding packages cost an average of $5,000. That’s $14,000 less than the $19,000 listed in Modern Bride as the average cost of weddings today. The $5,000 price tag gives you lodging at the best hotels, sumptuous local food, personal pampering, and an exotic vacation — in addition to a wedding! With the money you’ll save by eloping, you can host a lavish reception for family and friends upon your happy return, treat yourself to a pair of diamond earrings to match your new ring, or even buy a 2nd vehicle. Saving time can be as important as saving money. Ms. Tabb testifies that her weddings were planned in anywhere from a few weeks to a few days. Tabb and Silverstein eloped ten times and were legally married in far-flung locales like Kenya, the Galapagos, and Jerusalem. Their Fiji ceremony came with transport for the bride by raft, after which she was carried to shore by islanders. The happy and satisfied couple claims that each wedding was classy, well done, and definitely worth the money. Perhaps the best part of an exotic getaway wedding is the adventure. Even without getting married on skis in the Alps, your celebration is sure to be delightfully unique. You’ll get an insider’s perspective of the local culture and, while every detail may not be perfect, Tabb and Silverstein believe this only adds to the charm and appeal of the experience. If you’re in the early stages of planning your military wedding, you may have noticed that there are a lot of different things to keep in mind, and lots of rules and etiquette to follow. Below is a list of things to keep in mind as you’re planning your wedding, as well as some helpful tips that may make the planning process run a lot smoother. 1. Decide where: Do you want the ceremony to take place in a military chapel, on academy grounds, or at a civilian place of worship. The sooner you know this the better, especially if you decide you want to get married on Military Academy grounds. Military undergrads aren’t permitted to get married, so space is limited right after graduation. 2. How do you want to decorate: The sooner you know where you want to hold the ceremony the better, because some sites have particular rules and regulations as to how their facility is decorated; some do not allow additional decorations at, which is something you need to know. 3. Don’t forget the ranks: You can order traditional wedding invitations, but don’t forget to include any military titles held by you, your fiancé, or either sets of your parents. Some brides choose not to list their rank, but it’s completely up to you. 4. If you want to welcome your guests to wear their full dress uniforms, make sure you indicate that on the invitation by saying something to the effect of, “Full dress uniform invited”. 5. Wedding Party Attire: The Bridesmaids traditionally all wear long, formal gowns, and the groom and/or groomsmen typically dress in full uniform. Brides in the military can choose to wear a traditional wedding gown, or they can also dress in uniform. If she chooses to wear a uniform, of course she can still carry a bouquet. 6. The Arch of the Swords: In most military weddings, the honor guard will form an arch that the bride and groom can walk under as they leave the church. It is preferable that six ushers from the wedding perform this ceremony, but many more can be used. Also, if you do not have enough swords or sabers rifles can be used. 7. At the reception, seat military guests according to rank and title. 8. Use a sword or saber ready to cut the cake at the reception. The guests will love it, and it adds a dramatic touch to your wedding reception. 9. Use military cake toppers according to your branch! There are hundreds of options that you can choose from that will add a personal touch to your cake. 10. To complete your military themed wedding, consider using tiny military flags or other military symbols as decoration at the reception. How Well Do You Know the Bachelorette? Have the M.O.H or some other bridesmaid ask a series of questions that range from naughty to nice. This game makes a great ice-breaker that will really get your group talking before the evening’s festivities. You can have the questions written out and have everyone fill out the forms, or you can ask the group as a whole. Ask questions like, “What is your favorite romantic movie?”, “What was the bachelorette’s first date?” etc. This is a pretty simple game that you’ve probably played at a slumber party, where all sorts of truths come out. To play, one person either reads from a card or states, “Never have I ever lied about my age” or “Never have I ever went skinny dipping”, and those people who have, either take a drink, or lose a point, or however you choose to play the game. Give the bride a t-shirt with candies (lifesavers, or lollipops) stuck to it and charge people to lick them off. Create a list of as many items or tasks that you want the bride and/or bridal party to find/complete before the end of the night (usually it ranges from 10-35 items/tasks). You can make them as ridiculous or tame as you want. Examples: Call in a radio station to request a song for the bride. If you’re bridesmaids are married, ask them to bring a video from their wedding. Every time the camera shows the bride’s fake, nervous smile everyone drinks. Every time the groom wipes his nervous brow, every time a drunken bridesmaid stumbles across the dance floor, the whole party takes a drink, or gets party points (however you choose to play).